Jason Hartman talks with Allen Pitts, National Media/PR Contact for The Amateur Radio Emergency Service. 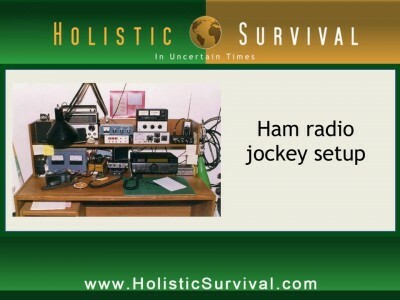 Allen offered many valuable resources on this episode of The Holistic Survival Show http://holisticsurvival.com/category/audio-podcast/ including info about ARRL. Founded in 1914, The American Radio Relay League is the national association for Amateur Radio in the USA. Today, with more than 156,000 members, ARRL is the largest organization of radio amateurs in the United States. By 1914, there were thousands of Amateur Radio operators–hams–in the United States. Hiram Percy Maxim, a leading Hartford, Connecticut, inventor and industrialist saw the need for an organization to band together this fledgling group of radio experimenters. In May 1914 he founded the American Radio Relay League (ARRL) to meet that need. At ARRL headquarters in the Hartford suburb of Newington, CT, a staff of 120 helps serve the needs of members. ARRL is also International Secretariat for the International Amateur Radio Union, which is made up of similar societies in 150 countries around the world. Jason Hartman: Welcome to the Holistic Survival Show. This is your host, Jason Hartman, and this is episode #35. Today I’m happy to say we’re going to talk about a somewhat overdue topic and that is the topic of communication. I really wanted to address this topic a lot sooner because it is critically important in a survival situation, whether it be natural disaster, civil unrest, acts of God, whatever it may be. We really need to know about communication. And I’ll tell you, folks, do not depend on those wonderful little modern conveniences, our cell phones, when it comes to something like this. We have got to be prepared with our own communication system that does not depend on the grid, that does not depend on other services where we can communicate independently of the grid, and we can communicated independently of the phone company, of the cell phone company, any type of communication like that. And that is what? It is of course Amateur radio, otherwise known as ham radio. So today we have the national media and PR contact for the Amateur radio emergency service, and that is Allen Pitts. And he comes to us from Connecticut. So we will be back with the interview with Allen here in just less than 60 seconds on the Holistic Survival Show, where we always are focused on protecting the people, places, and profits you care about in these uncertain times. It’s my pleasure to welcome Allen Pitts to the show and he’s the national media contact for the American Radio Relay League, and it is great to have an expert on the show to talk about Amateur radio. Allen, welcome. Allen Pitts: Well, thank you very much, Jason. Appreciate it. Jason Hartman: I think today a lot of people are really, really delusional in being so dependent on cell phones and it seems like Amateur radio is a lost art. When I was a kid, people used to have CB radios and ham radios. And nowadays everybody just has a cell phone. Tell us about that. Allen Pitts: Well, cell phones have taken over this society. There’s no question about that. And they are very handy little gizmos. I’ve got one of them I built right now. And the truth of the matter is that I enjoy it immensely. And 99% of the time it is absolutely a necessity and it works wonderfully. And this is good, not a problem. Jason Hartman: In the bandwidth in between, right? Allen Pitts: In between other things. And you might get something through there, but I would not want to bet my life on it. And this is where Amateur radio comes in. Jason Hartman: Tell us if you would, Allen, what happened like post-9/11, during Katrina and some of these big disasters, when everybody was jamming the system. Were people able to make calls or was everything just down, no service? Allen Pitts: Katrina, let me pick on that one, because that one actually got very, very interesting in different ways. Katrina was interesting in the sense that the cellular system indeed truly was completely overloaded and that a lot of the communications between cell towers and to relay centers was destroyed. What developed, though, was that some people, on rooftops, had a working cell phone and were actually able to make not local, they couldn’t call the local police or anybody else, but they were able to make long distance calls out of their area code. And we actually had a most interesting situation develop. A person with her family on the rooftop were dialing random numbers, happened to get a hold of a blind lady in Virginia. Now the blind lady in Virginia, when she realized it wasn’t a prank call, didn’t know what to do with it, but she knew another blind lady up here in Connecticut who actually happens to be the section manager for ham radio for the state of Connecticut. So because of the association with being blind, she called Betsy up here. Betsy, being a ham, knew exactly what to do and she relayed the message back through Texas using Amateur radio, Texas sent it on into the New Orleans Emergency Operations Center and they sent a coast guard helicopter and got these people off the roof. That kind of relay type of thing, of signals, happen all the time with Amateur radio people. So, in this sense, the cellular system kind of worked in funny places, but not anything you could predict, and was an abysmal failure for anything locally. Most people could not call at all. I want to make that clear. Most people had nothing. But some of them were able to get long distance signals and it’s just the way the cellular systems or what was left of them was able to route things at that point. For the most part, it was the hams. And especially during those first approximately 2 to 3 days, Amateur radio was the one carrying the ball for everything down there. Jason Hartman: So tell us, ham, I mean where does that word come from? That must be an acronym? Allen Pitts: Not really. Some people want to say it’s helping all mankind, but that’s not actually where it came from. When radio started, actually the first wireless experimentations have been in the very late 1800s and then into the early 1900s. You had Western Union and other professional telegraphers who this is what they did. They sent morse code and they sent it very, very well, thank you. Well, along comes these amateur people that are experimenting with this new fangled wireless thing, and dangit they’re using Morse code and they’re ham handed. I mean their code sounds horrible. The professional telegraphers had developed an elegance where you could identify exactly who it was just by how they sent code and the speed and everything else that they did, and the amateurs were indeed rather clumsy at it at the beginning. They were ham handed. Allen Pitts: And they started to call them hams. And in good Yankee Doodle fashion, like the British used to call the colonials a bunch of Yankee Doodles, and you saw what we did with that song, didn’t you? Well the hams set the name where it was pride. Jason Hartman: They took over. Now you have to be licensed to be a ham radio operator. Jason Hartman: And first of all, just give us a quick overview of how licensing works. I know it’s pretty easy and it’s non-expensive. And then let’s talk about the different kinds of radios and equipment and what that costs and what you do with it after you have it. Allen Pitts: Well, yes, you do have to be licensed. Unlike citizens band or the Family Radio Service, the FRS, the Family Radio Service, these are the little cigarette pack size radios you can buy at Wal-Mart. And some of your listeners may remember the CB craze that went around a couple of decades ago. And that’s still around, not nearly as much, but it’s still there. But Amateur radio is FCC licensed radio service, just as much as your broadcast radio or your business band radio. And to get to your Amateur radio license, you don’t buy it, you earn it. There are three levels of licensing. There is the technician class. Now, this is one that’s intentionally meant to be fairly easy to get. Most people with a brain and an IQ above room temperature are very simply a good week’s worth of study, take your exam on a weekend, and you can probably get your technician class license. Now, why do you need the exam and the licensing? Truthfully, you’ve got the ability with the technician class license to talk internationally at that point. Well, radio waves don’t stop at borders. So we want you to know what you’re doing so you don’t get into trouble. But it’s also kept fairly easy because we want a lot of these people. This gives you a communications ability that you could go direct. When we say go direct, this is what I mean by it. You’re not going through any other infrastructure. You’re not going through any repeaters. You don’t need anybody’s cell towers. You don’t need anything, nothing between you and the other guy but air, and you can go direct 30-40 miles fairly easy if you start using some of the repeaters. You can talk around the world with it. You can talk to satellites, all kinds of things just with a technician class license, but you need to know what you’re doing so you don’t get into trouble and screw up somebody else. Then the next one is the general class license. The general class is the middle license, a little harder to get, takes some more study, more learning. General class license opens up a whole new world by getting it to what’s called HF. Jason Hartman: HF, what’s that stand for? Allen Pitts: Okay, HF is high frequency. High frequency radio signals do funny things. Initially, they gave that part of the radio frequency spectrum to the hams because nobody ever thought it was worth anything. But the hams found out something very interesting. These types of radio waves in these frequencies ricochet all over the earth. They bounce between the earth and the ionosphere way up in the sky. And this is the kind of talk where I can sit in my bedroom where I’ve got a radio, and there’s a little antenna sticking out on the side of the house. It’s not even a big one. And all of a sudden I’m talking to those people in Japan. There are people in Africa. For me, being here in Connecticut and talking to Europe, I can do any day of the week. .And there’s nothing between us and them in here. Jason Hartman: Well, see, that’s what I’ve always wondered. I mean I always knew that you could bounce off the ionosphere, but if you can use the ionosphere, why use repeaters? Is it just not dependable? Does it depend too much on weather conditions? Allen Pitts: It’s gonna change. You’ve got it exactly. The ionosphere constantly changes. It changes with the solar cycle which is an 11 year cycle, how many sunspots. It changes with the annual season, whether it’s spring, summer, fall, or winter. And it also changes each day. One of the fun parts about it is what’s called grey line. It likes to bounce signals right along the edges of dawn and dusk. So like if I wanted to talk with Brazil right about now in New England, I would probably try and get them on about 6 o’clock at night just as the sun is going down. That grey line as the sun’s going on, just point an antenna south, not a problem. So part of the art form of imagery, and it is an art, is to know which frequencies are gonna bounce which way, at what time of year, and the season and time of day, and be able to make these communications whenever you need to. Jason Hartman: So the repeaters are for more dependable. And are there just two classes of licenses then? Allen Pitts: No, there’s a third one. Allen Pitts: The third one is called the Amateur Extra. And that one’s hard. Bluntly, that one took a while. Jason Hartman: Do you have to know Morse code for that one? Allen Pitts: Let’s put it this way. I am considered to be fairly intelligent and that thing was hard. Jason Hartman: Was it really? Allen Pitts: Okay, what the Amateur Extra does is it gives you more frequency spectrum that you can use. Each one of the license classes gives you a piece of spectrum that you can use. And the Amateur Extra gives you the whole enchilada. Jason Hartman: Which ones do you need Morse code for? Allen Pitts: None of them. Jason Hartman: None of them now. Oh, wow, that’s great. Because they used to have a license called the no code license. Allen Pitts: Yep, the no code tech. Now, an interesting thing happens there. Morse code, as a proficiency, was dropped as a requirement a couple of years ago. Allen Pitts: Yeah, in many, many ways. But what actually happened in real life, the use of Morse code went up significantly. Allen Pitts: Uh huh. And we were predicting this. A lot of people were kind of scratching their head and looking at us funny, but we had seen Morse code requirement dropped in Europe and a couple other countries before. And it’s the Tom Sawyer effect. If you remember, Tom Sawyer was told by Aunt Polly he had to go whitewash the fence and it was a chore and nobody wanted to do this or whatever. So what did he do? He turned it around and said, okay, let’s turn this thing into a game that we’re just doing for fun, not being required to do it, and all of a sudden by making it into a game and doing it for fun, he’s got every kid in the neighborhood whitewashing the fence for him. Same thing happened with Morse code. And we’re seeing it now, especially with kids, when nobody’s looking over your shoulder, nobody’s going to be tested on it. Morse code is one of the biggest things that attract kids to Amateur radio. Jason Hartman: Is it really? Allen Pitts: It’s like a thwarter. It’s their own secret signal system. And whenever we’re doing a display, you put out a Morse code key, and we’ll set it up where it actually can go into a computer, and like if you typed “K”, da-da-da, it’ll come up with a K on the screen, you can’t get these kids off of the thing. Jason Hartman: Really? Okay, that’s interesting. Allen Pitts: They love it. Jason Hartman: Well, they sure like texting rather than talking, too, oddly enough. Allen Pitts: You don’t need Morse code anymore to get your license. But okay, if you are interested in learning how to get your license and all, there’s a couple of places you can go. I’m going to drop some websites on you, so get your pencil. One of the simplest ones is HelloRadio.org, and you can find out about Amateur radio there. And that talks about the friendly, fun side of Amateur radio. And we’ll get to a little more of this probably in a minute or two. But there’s another one called WeDoThat-Radio.org and on that website you can learn about all the different technological things that hams are into, everything from SETI to computers to using radio with robotics and satellites, and even time change and time shifts and time in space are being done by Amateur radio people. Jason Hartman: And you probably should just quickly tell people that SETI is the search for extra-terrestrial life, right? Jason Hartman: And ham radio is involved in that how? Jason Hartman: Just looking for signals from outer space? Allen Pitts: Yes, basically Amateur radio people are able to monitor all kinds of different frequencies and help SETI. They’ve got some incredible equipment, no question, but a lot of times it’s the little guys out in the middle of nowhere that all of a sudden are picking up interesting things. Jason Hartman: Yeah, really interesting stuff on this website. Wow, it’s otherworldly, I’ll say that. Allen Pitts: There’s all kind of things. Hams are into all kinds of different uses for wireless communication. It’s not just talking around the world, but it’s also exploration for all kinds of things. And then, of course, there’s emergency stuff. And if you go to EmergencyRadio.org, you can read about how Amateur radio is organized into being able to respond to an emergency situation through the Amateur radio Emergency Service. Allen Pitts: So those are the big three. One is Hello, that’s the friendly fun side of radio. WeDoThat-Radio is the technological development and exploration, kind of a do it yourself type of arrangement. And then EmergencyRadio.org is about the Amateur radio emergency services. Jason Hartman: So how much does it cost and how much time does it take to get each of those various three licenses? Allen Pitts: Well, let’s start out with the technician. Like I say, you can get this in the websites I’ll show you, the books approximately $20. You go and you need to study for about a week. You have to take the FCC exam which you actually have to show up for. The exam fees are less than $10, usually about $7 or $8. And that can get you your initial FCC license now. The next question is, okay, you’ve got your license, what do you do with it? Obviously, I would say two things. Number one, get with another ham, somebody with experience, we call them Elmers, but these are mentors. And the other is getting your first radio. And you’ll find ARRL has got some excellent material on our ARRL.org website about buying your first radio as to suggestions. The cost, if you get a good used one, about $50-$60. And if you buy a new one, it’ll range anything from approximately $100 to $400, up in that range. For the most part, most people for their very first radio, they can figure about $100 to $150. And it gets their feet wet. It gets them started in something, and they learn with it. And once they find out how much fun it is, they go from there. The general exam will probably take you, working in the evenings type of thing, my guess would be about another month. A lot of it is duplicating things that you learned in the technician class license, but at the same time you’re going in more depth. And then you get into HF radios, now you’re talking some serious equipment, and you’re probably going to be looking at anywhere from $400 to several thousand dollars. Jason Hartman: And about the different radios, there’s like a 2 meter…I mean this is the size of the wave running through the air. Is that why it’s called a 2 meter? Allen Pitts: That’s exactly it. The easiest way is the Amateur radio people have a number of different bands now. Let me explain what I mean by a band before I crush your listeners’ eyes here. If you’ve got a car radio, you’ve probably got two bands on it, AM and FM. Those are bands. Well, we’ve got a whole flock of them. There’s about 15 or 16 of them depending on how you want to count them. We’ve got everything from very low frequencies to ultra-high frequencies. And we use them all in different ways at different times for different things. For example, the two meter band which is one of the most popular, by itself a little handheld radio on a 2 meter band probably has got a range of about 30 miles. If you turn around and pump it through a repeater, and there’s a whole lot of 2 meter repeaters all over the place, all over the country, if you put it through a repeater, a used signal will get bounced around, literally can go around the world. And these are very, very popular radios. My first radio was a 2 meter radio and right now I’ve got about 4 of them, because no matter where you go, people are on 2 meters all over the place. But 2 meters for the most part is line of sight. You’ve got to get high. You’ve got to get your antenna high. It’s going to go in a straight line. It’s great for talking to satellites, but it would not be a good thing for talking let’s say with China because it wouldn’t go around the world. When you start getting lower infrequencies or when we get down into 10 meters, 20 meters, up to 80 meters, these are the signals that I was talking about now that longer wavelengths, lower signals, and these are the ones that ricochet around the world. Then when you finally get down to the real low signals, 120 meters and we’re doing some experiments even lower than that, these signals pretty much follow the curve of the earth and then die. We are now down into the same area as the commercial AM broadcast radio, which as you know, if you listen to, I don’t know, WABC out in New York, you’re probably going to lose them after about 60 miles. But every now and then you could hear them all the way out into Luther, Montana if three conditions just happened to be right and the signals ricochet, but don’t plan on it. So different radios, again, cost different amount of money, but it’s something that is doable by moth people. And if they are interested in emergency related stuff, a 2 meter radio that they purchased for let’s say, I don’t know, $150 to $200, a good 2 meter radio, will do everything that they’re going to need. It will allow them to work with, if they want to volunteer, and we’d love to have them to work with the anti-radio emergency services, if they choose not to for whatever reason, maybe they want to volunteer and work with the American Red Cross, great. Or with the Salvation Army, they’ve got the Saturn team, work with them, great, wonderful. That 2 meter radio will be most appreciated. Or their search team, there’s a lot of the community emergency response teams popping up around the country. They love those guys. But even if you didn’t want to get involved with anybody, you just wanted something for an emergency, 2 meter radio is perfect just to have. And a lot of times, especially out west where people are getting lost in mountains and valleys and gullys and deserts, 2 meter radio keeps coming to the fore. Somebody pops up on 2 meter radios, you’ll get hurt. Somebody will hear you. It happens regularly. Allen Pitts: Not really. Once you get lower frequency than 2 meter, the radios start getting bigger. Then you get into more the desktop or the mobile, the ones that fit in your car or the even bigger desktop ones. 6 meter, 2 meter, 440, 220, these higher frequencies, that’s where the little guys, the little weak old handy talkies, or HTs for short, that’s where they shine. The lower frequencies, they get the bigger radios. Jason Hartman: What else should people know? Allen Pitts: I would hope they would first know that while a lot of people get involved in Amateur radio because they have emergency capabilities, the bottom line is it’s fun. I didn’t get involved because of emergencies. I got involved because it was fun. Jason Hartman: Now, let me ask you, and this may seem like a really silly question, but why is it fun? I mean in today’s world of instant communication with the internet, with Skype, with cell phones, you can call the world basically for free. It’s sort of odd that someone would consider it fun nowadays. And I’m just playing devil’s advocate. I know there are people who think that and that’s why I want you to address that. Allen Pitts: Well, Skype isn’t free. You’re paying for internet access. Jason Hartman: Well, if it’s Skype to Skype. Allen Pitts: Somewhere. And the other part is you’re not doing it. Now, there’s a whole section of society that for whatever reason we are given the genes that “Wait Momma, please, I would rather do it myself”. I enjoy creating something. I enjoy doing something where it’s me that’s doing it. I may, with circuit boards and some of this stuff, I may not have made that radio as such, but I modified it. And I put together that radio along with this power supply along with this particular antenna. I designed that system. And when I’m sitting there talking and using that system and I’m talking to somebody else that could be, literally in my case, it could be across the street or across the continent. Jason Hartman: It could actually someday be out on other planets or in space. Allen Pitts: It’s my creation that’s doing that. It’s not a cell tower. It’s not AT& T. IT’s not an internet system. It’s my system that did that. And if I want to go and modify it and change it, I can do that. I can’t do that with a cell phone. I can’t take my cell phone apart and modify it. I can’t change its frequency. I can’t do anything with that cell phone. I can’t even call another cell phone. I’ve got to go through a cell tower to do it. Jason Hartman: So when you say it’s your system, you’ve modified it, and it’s really kind of a really cool thing to create that, and Ham radio operators are encouraged to tinker and work on their system and take them apart, at what level does one do that? Are they just purchasing parts and plugging them in, kind of like you can if you take a PC apart? Or are you talking about getting out the soldering iron and really making stuff? Allen Pitts: It depends on how far you want to go. Some people will buy out of the box, here’s the radio, that’s it. And other people will take parts and modules, and like you say, it’s like putting together a PC. They’ll take this card and that other piece and this power supply and this particular modulations unit and they’ll just plug it together. And then there are those that yes they do. And a whole lot of people are enjoying putting together little kits where literally they get out the soldering iron and the kit is sold, it’s kind of like putting together some of the old plastic models, except you can’t sniff the glue, there isn’t any. But they put the kits together and then it’s their kit and they’re able to make it and send a signal. A lot of them are what we call QRP, which is very, very low powered little, tiny kits that are battery powered type of thing. And then they have fun just seeing how far they can get that signal just because they did it themselves. Amateur radio is the last place where you can experiment with wireless signals on your own without being a corporation, without being a major company. There’s no place else you can go other than Amateur radio where can learn and experiment and try and fail and try again and ultimately get it right working with wireless technology. This is why so many engineers in wireless, they’re Hams. I mean you look behind every rock, there’s a Ham in this stuff. Jason Hartman: It really is fun. When I was a kid, I used to play with this stuff and buy the kits at Radio Shack and make my own integrated circuits and relays. And I just love that. And I don’t mean manufacture my own integrated circuits, but you would make one on the board by combining different components. It’s a neat, fun thing. But the thrust of this show is emergencies. It’s survival situations. And everybody listening has just got to understand that the communication methods we take for granted every single day in our wonderful, technological, modern, convenient lives, there’s a very strong likelihood they won’t be there in an emergency situation, or at the very least they won’t be there for a certain period of time. Anything else as far as emergencies that someone should know? Because I just want to kind of bring it back to that topic before I let you go. Allen Pitts: Sure. Well, the biggest thing is not just getting your license, that’s easy to do, and not just buying a radio, that’s easy to do. Get yourself affiliated with one of your local clubs. Now, the websites that I gave you before, the HelloRadio.org, the EmergencyRadio.org, or WeDoThat-Radio.org, all of them have links and ways to get it and build and get into what a ARRL’s database is, where you can type in your zip code and find out where the local clubs are. The reason to contact the local clubs is so they will be more than happy to help you even more about Amateur radio. What’s going on in your area? How you as an individual with your radio can integrate with emergency services? When something does happen, that you can come up on the air and be helpful, not just in relaying anything from like Sky Warn, relaying storms, and tornado spotting type of stuff, but also being able to relay information, when somebody else might be in trouble and they’re asking you relay a message on end. So learn how to do that and that would be most helpful in so many places. So don’t just be an individual out there. Be part of the team. Allen Pitts: We’re more than happy to help you. Jason Hartman: Good way to contribute for sure and be a real resource in an emergency situation. And my pilot friends, they do that. They volunteer for if there’s an emergency here, they have to find someone for a rescue at sea or whatever. They’re a part of it, so they get called out in those situations and go up in their plane which they love to fly and really make a difference. So that’s a great thing, too. And when it’s a whole community, it really is. Are there any stats on how many Ham radio operators there in the US? Allen Pitts: Oh yeah, 694,000. As a matter of fact, we’ve been going through a 4 year period of major growth. We get to juggle…I take personal pleasure in this. Approximately four years ago, AOL came out with…I don’t even know who wrote it, but I spotted it first on the AOL and they listed 25 things that are disappearing from America. Jason Hartman: Yeah, Ham radio, I bet that was one of them, right? Allen Pitts: Yeah, it was 17. I’m kind of watching AOL stock and going mm. But any case, the Amateur radio is going…Right now we’re in a major growth period, primarily because of the emergency communications capabilities. What people are finding once they do get in, they may get in for that reason, they’re finding it’s a whole lot of fun. And there’s about 2 and a half million Hams around the world right now. It’s hard to say exactly, because different countries count people different ways. Some count the actual number of noses, another count the number of licenses, and in some places one person can hold more than one license. So the best estimate is an honest 2 and a half million. Jason Hartman: And do you tribute the growth…I mean you said it’s been a 4 year growth spurt. What were the number of licenses? There are 600 and some odd thousand now in the states. What was the number 4 years ago? I mean how much growth has there been? Allen Pitts: Well, last year we added over, what, 30,000 new hams last year which topped the year before which I think was 25,000. Jason Hartman: So 5% or so, yeah. Allen Pitts: So yeah, I don’t have the exact numbers in my head, but it’s been down to about 630, it was even lower at one point, but right now it’s 694,000 and we’re looking already this year we’ve bettered last year and we still got several months to go. Jason Hartman: I sort of wonder if that’s sort of a barometer for keeping the pulse on what people are thinking. Are people becoming more grim? Are they becoming more concerned about the future? I mean I know gun sales have been up ever since Obama got elected. Ham radio usage is uip. That’s an interesting thing. Preparation is good, but does it show that people are more concerned about natural disasters, civil unrest, whatever it might be? Allen Pitts: I honestly don’t’ have a good answer on that. I’d be totally speculating on that one. But what I can say is that in one area that you don’t want to play around with and that is if something happens…I don’t know if it will or won’t or what’s happening, my Ouija board is as cloudy as anybody, but at the same time it’s nice for me to know if something were to happen. I may not be able to deal with it, but dangit, somebody’s going to hear me. That, I know it will never be a scream in the darkness. Someone will hear me. And what am I screaming about? I don’t know, but I will be heard. Jason Hartman: Yes, well that’s good to know. Allen Pitts: And that reassurance is very, very comforting. Jason Hartman: Excellent. Well, Allen, this has been great talking to you. Again, I’m so glad that we finally got someone on the show to talk about this topic because I do think it’s a big of a lost art. I think it’s very important. It needs attention. It’s simple, it’s low cost. Everybody ought to go out there and do it. And I am of course talking about myself as well when I say that I need to get on this. So I’m gonna take care of it now that I’ve had you on the show. Allen Pitts: Send you a book. Jason Hartman: Oh, thank you. Yes, please do. And I appreciate your insights and so do the listeners. And keep up the good work out there. Allen Pitts: Well, I’m going to follow you now and see if you do it. Jason Hartman: Alright, hold me accountable. Jason Hartman: Thank you, Allen.